We had no idea these wonderful trailers were made in Texas! What a perfect opportunity to check them out and get a factory tour. Look! 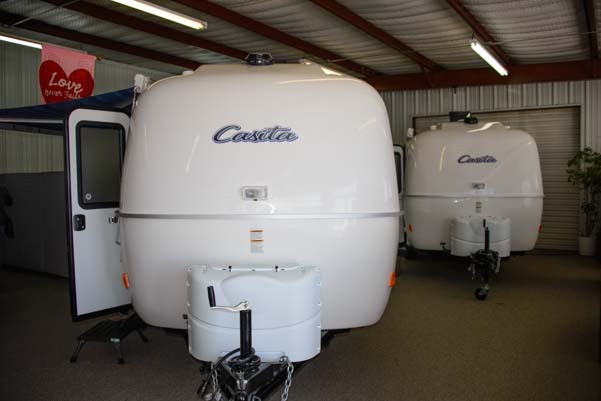 It’s Casita Travel Trailers!! We turned our buggy around and somehow squeezed it into their front lot (which is just the right size for Casitas), and jumped out to prowl around the lot. There were dozens of brand new Casitas lined up, and each one had an owner’s name printed on a window sticker. These are very solid and well made little trailers. When we poked our heads in the door of the building, there was a flurry of activity going on inside. At least three couples were walking in and out of the four trailers on the showroom floor, and several sales people were in cubicles along the walls, filling out order forms and finalizing the paperwork for trailers being picked up. These things are Popular!! There were four trailers on the showroom floor, and we admired every one! 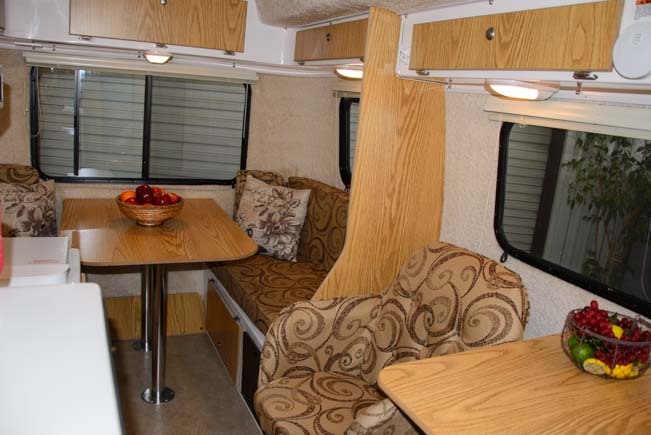 There are four interior plans for the 16′ and 17′ models, and several have a king bed option! 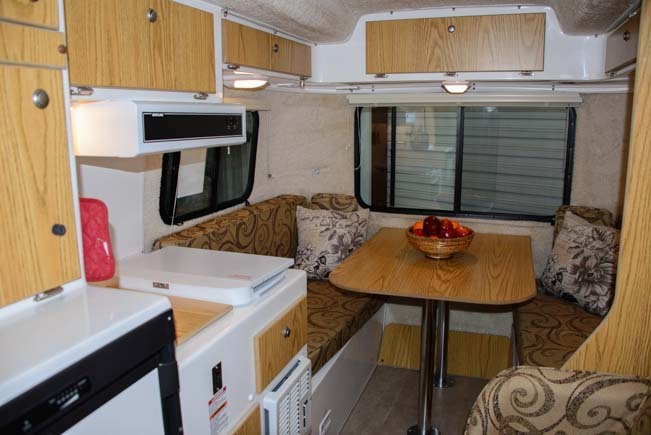 The Freedom model has two captains chairs and looked really inviting. “That model gets a lot of interest,” Carla told us when she joined us a few minutes later, “But most people end up buying a different floorplan because those chairs are a little impractical.” I sure liked her straight forward approach! Some models have furniture that folds into a king size bed! There are lots of other options for these trailers too, including fresh water tanks as big as 25 gallons, a microwave, and a furnace. Virtually all Casitas are special ordered by the buyers who will be using them. Winter is the slow season, Carla told us, but they keep building trailers even when orders slide. Some winters they end up with four or five trailers that weren’t special ordered, but they’re always gone by spring! Prices for new Casitas range from around $14k to $20k. The kitchen is small, but it has all the things you need to make a good meal. Casita doesn’t have a dealer network. Instead, they have a dealership in the front of their building, where all the selling is done, and they have a factory out back where everything is made. “We build 14 Casitas a week,” Carla told us, “and it takes about two weeks to build one from start to finish.” That means there are about 30 on the line at any one time. 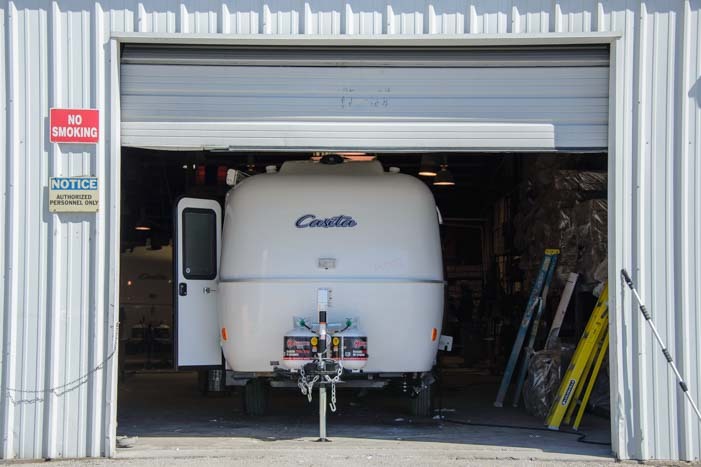 A brand new Casita peeks out of a bay at the factory. Out back, the factory was absolutely humming. 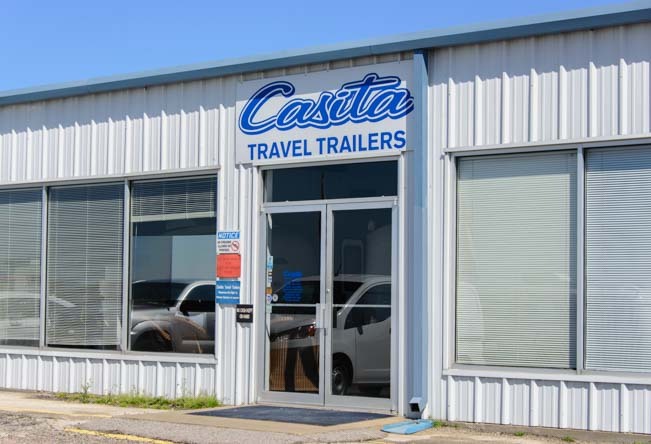 Most of the employees have been with the company for at least 10 years, and since the company’s founding 25 years ago, Casitas have grown ever more popular. We couldn’t take any pics in the factory, but it was a great scene. Trailers surrounded us on all sides, each in various stages of completion. They are rolled by hand from station to station down the line! Outside a small tractor wheels them around with ease. Casitas are pretty easy to maneuver around the lot! The top and bottom of each trailer is a molded fiberglass shell, and the two halves are joined with a bonded seal that is fiberglassed in, much the same way as our sailboat was constructed. The final testing stage was most impressive. Each Casita takes a 30 minute shower at full blast while a technician checks every square inch inside for leaks. They had shower nozzles aimed at each window and the door as well as the roof. How amazing to watch a Casita getting totally drenched by a virtual hurricane! A storehouse full of future camping memories! Folks sometimes ask us how to “test drive” the RV lifestyle. Without a doubt, the best way is to get a small rig and go do some camping. Our first RV was a popup tent trailer. 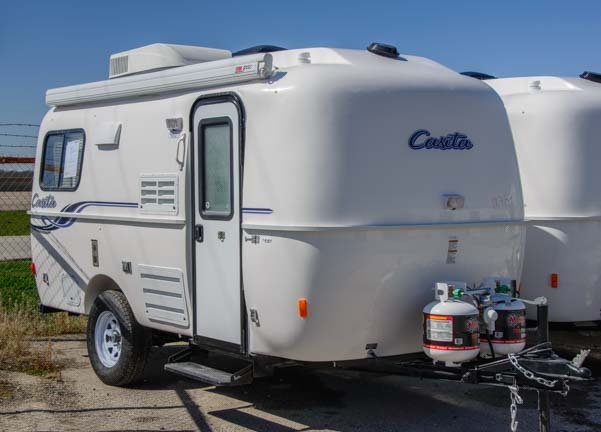 The Casita is a wonderful first RV, because it is a very well built trailer that has all the functionality of bigger rigs, but doesn’t require a big truck to tow it (they weigh about 2,500 lbs) and doesn’t require a lot of space to store. Couple a Casita trailer with a portable solar power kit and you can learn all about boondocking and your rig will fit comfortably into any campsite anywhere! 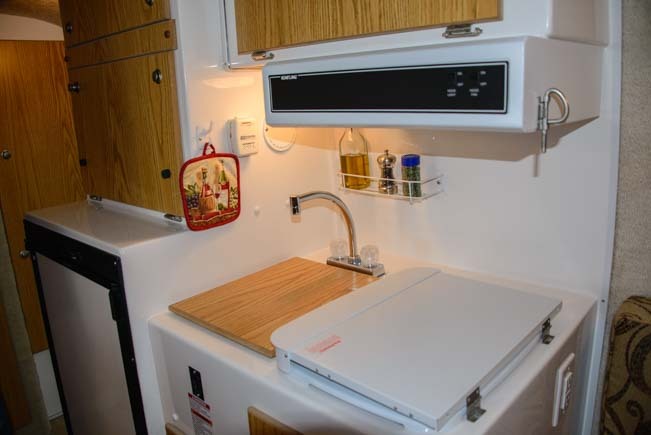 When you’re ready to upgrade, these popular RVs undoubtedly hold their value better than most. Love My Casita – Check out the A-Z Guide! Learn RVing in a Cheap and Small Trailer – Popup tent trailers are a blast! 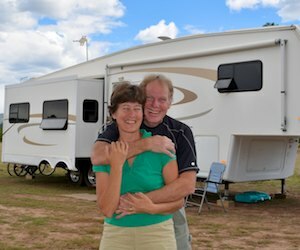 How Big an RV Do You Need? – There are many virtues to traveling in a small rig! This entry was posted in Quick Pics and tagged Full-time RV Lifestyle, Non-Travel, Quick Pics, RV Factory Tours, Texas by Roads Less Traveled. Bookmark the permalink. 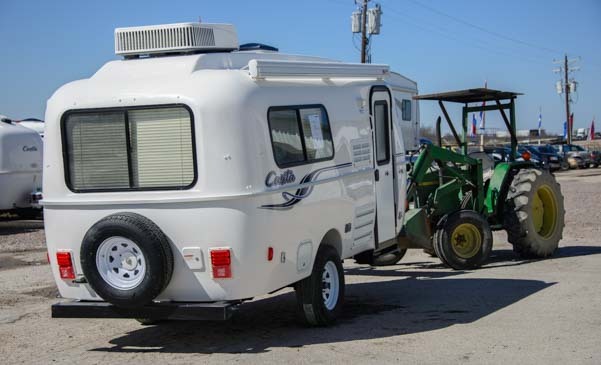 I’m the author of the Casita Travel Trailer A-Z Owner’s Guide and I can tell you firsthand that these little trailers are extremely popular, especially with Boomers. Please consider adding my website to your Casita links. What a great site, Eileen. I’ve added your link. Thanks for sharing! Thank you for adding my Guide to your list! This blogpage is a terrific resource for expectant and wannabe Casitans. We found our sweet camper finally. While it’s not a new one (2009) it was loved and well cared for. It took a while to find one but we are sure enjoying our casita so much. Because we have the dogs in the car with us, it means we stop every hour or so to let them get out, stretch their legs and do a wee. But this gives us an opportunity to explore many places, even if it’s just for a quick stop. I have no idea. 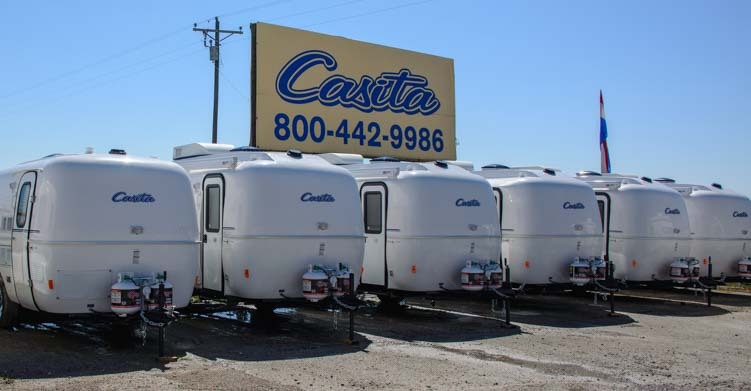 Why don’t you call Casita Trailers and find out?